My messenger type bag GIVEAWAY here. Closes 4th September. Now onto my slipper parade. 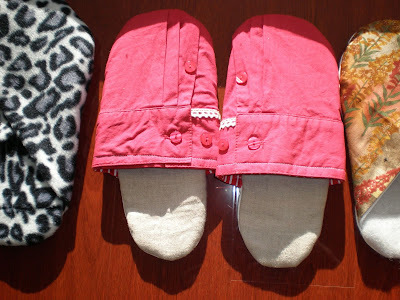 The pattern and instructions for these comfy slippers was found in the magazine SEW HIP issue 20. These slippers have cotton uppers lined with fleece. The sole is three layers consisting of curtain blackout (makes a nice non slip base), wadding and fleece. The instruction's diagram was a bit misleading and the layers came out wrong. The wadding is on top!!! I have corrected the pattern's instructions for future reference. Same as above 'Sew Hip' pattern. Made from soft fleece, making these very comfy indeed. 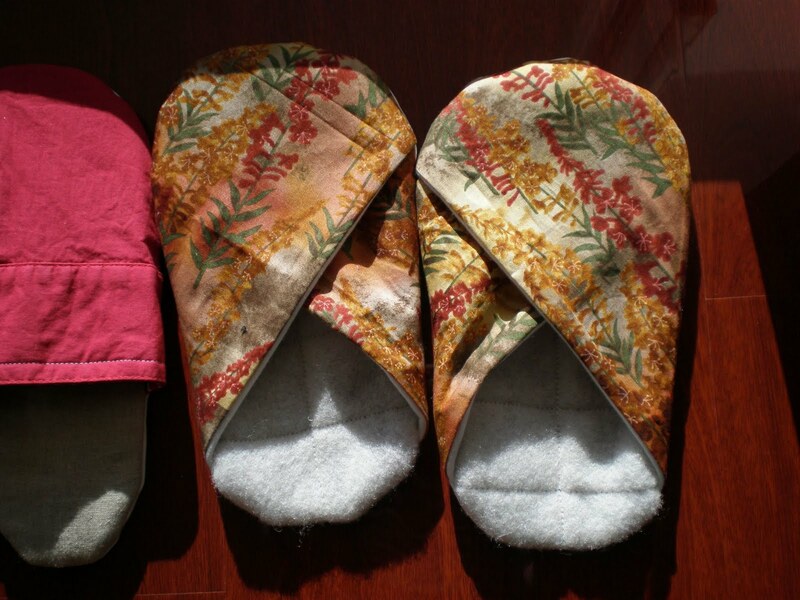 These red slippers were made by using the cuffs from a man's shirt! What a great recycling idea! I used this tutorial. It is written in a language I don't know, but the pictures were ample enough for me to work out how to put them together. I am definitely going to attempt these again. On the lookout for nice men's shirts now! I have given these slippers to a friend, who after her new house was built, did her own flooring using some beautiful polished floor boards. 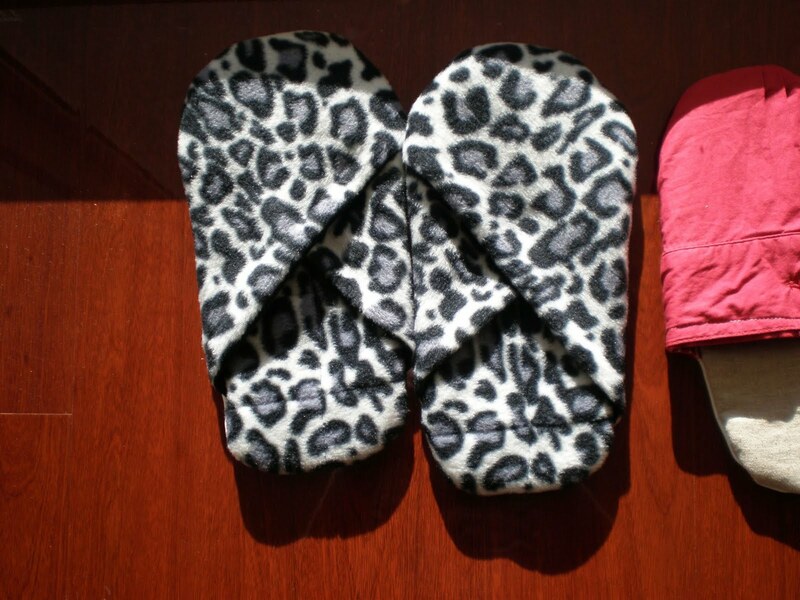 Hopefully her guests will use these slippers and help keep her floor looking fantastic! I know I will. PS To my friends who have entered my giveaway, if you haven't already done so, you can add another entry for being my follower. I will be using the number generator to pick a winner, so please get your extra entry!! Love those slippers! I've been looking for a kimono slipper pattern!! They are adorable! 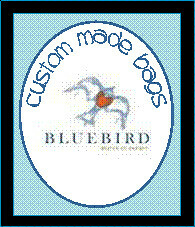 Good luck with your giveaway...your bags are great, too! 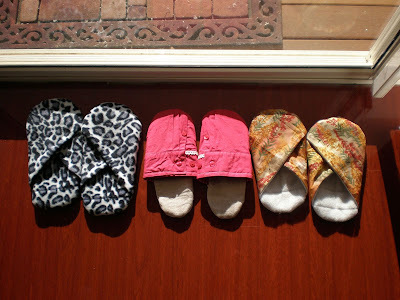 Love the slippers, they look very comfy. 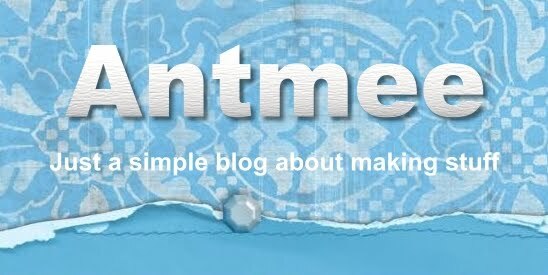 Thank you so much for being a part of my blog.I am delighted ^_^. And you are absolutely right in saying that the handmade gifts are the best.I really am looking forward to your post on your workstation and workshop ^_^ simply love it!! Love these slippers you are so clever. Really like the red ones with the mans cuffs. I bet your friend will really appreciate these slippers. 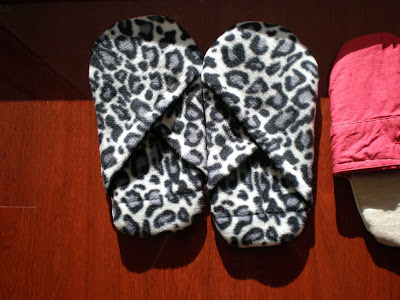 I love house slippers but it's never occurred to me to make them. I just bought a pair over the weekend for $9! Thanks for this post. Also, love the bags, all of them. Your work is beautiful. What a FANTASTIC pattern! They look fabulous! I love the one you made from the mens shirt. Sewing is my drug of choice!